For this assignment we were asked to sign up for a webhost and explain how we setup DNS. Over the last several years I have had the pleasure (displeasure if I am being honest) of trying out a variety of different web hosts. Through a process of trial and error I have come to use and appreciate Dreamhost. While there is a laundry list of nice things I could say about dreamhost, I will keep it short and relevant. First is the ease of use. 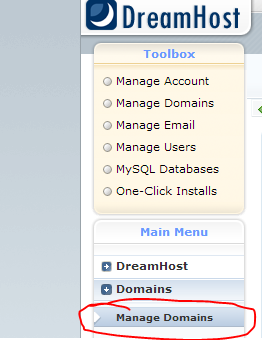 As you will see below, DreamHost makes managing a website easy. The panel is straightforward, and the wiki explains in simple english how to accomplish tasks. Second is uptime. There is nothing worse than having recurring outages from your web host. Dreamhost has a solid record of being up and working, and fixing issues promptly when things are problematic.I also love that that have a system status site and twitter account where they communicate open and often about any issues (Page, Twitter). Last is their support. They have a great team based out of Southern California that is quick to respond and very helpful. I highly recommend them. Step 1: From the Dreamhost Web Panel Select Manage Domains. Step 2: Click the button to add a new domain. Click the button to add a new domain. Step 3: Using the fully hosted options fill in the information about the domain you registered. Fill in information about your domain. Optional Step: If you registered your domain elsewhere you will need to go to that place and point the domain and the dreamhost name servers.